A Perfect little something for someone that may not celebrate the holidays but you'd like to acknowledge their importance in your life. Folks love these gift boxes. 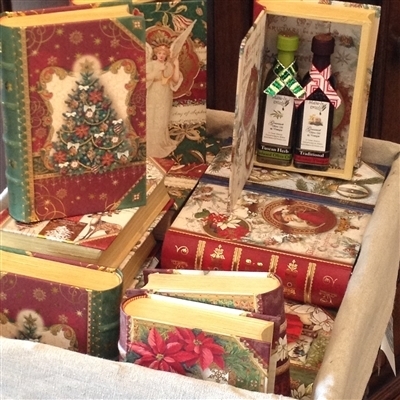 Great for book club members, scholars, reading lovers, colleagues, neighbors and all around a fun way to package your favorite oil and vinegar products. This box comes with two 2 oz Maine-ly Drizzle Products of your choice. If no choice is made we will include Tuscan Herb Organic Extra Virgin Olive Oil and 18 year Aged traditional Balsamic Vinegar (our number one sellers). We have an ample supply of each of these boxes. If there is a design that you see in the picture that you prefer, let us know in the comment section, during checkout. If by chance we don't have the chosen box someone from Maine-ly Drizzle will contact you.